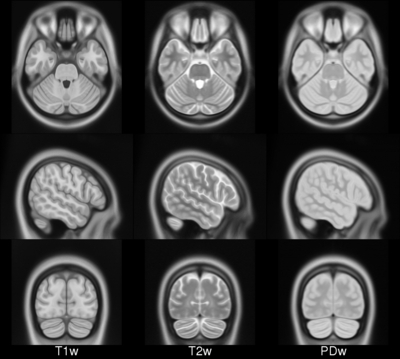 ICBM 2009a Nonlinear Symmetric - 1×1x1mm template which includes T1w,T2w,PDw modalities, also T2 relaxometry (T2 values calculated for each subject using single dual echo PD/T2 scan), and tissue probabilities maps. Also included lobe atlas used for ANIMAL+INSECT segmentation, brain mask, eye mask and face mask. Intensity inhomogeneity was performed using N3 version 1.10.1. ICBM 2009a Nonlinear Asymmetric template - 1×1x1mm template which includes T1w,T2w,PDw modalities, and tissue probabilities maps. Intensity inhomogeneity was performed using N3 version 1.10.1. Also included brain mask, eye mask and face mask. ICBM 2009b Nonlinear Symmetric - 0.5×0.5×0.5mm template which includes only T1w,T2w and PDw modalities. ICBM 2009b Nonlinear Asymmetric - 0.5×0.5×0.5mm template which includes only T1w,T2w and PDw modalities. ICBM 2009c Nonlinear Symmetric - 1×1x1mm template which includes T1w,T2w,PDw modalities, and tissue probabilities maps. Also included lobe atlas used for ANIMAL+INSECT segmentation, brain mask, eye mask and face mask. Intensity inhomogeneity was performed using N3 version 1.11. Sampling is different from 2009a template. ICBM 2009c Nonlinear Asymmetric template - 1×1x1mm template which includes T1w,T2w,PDw modalities, and tissue probabilities maps. Intensity inhomogeneity was performed using N3 version 1.11 Also included brain mask, eye mask and face mask.Sampling is different from 2009a template. All templates describe the same anatomy, but sampling is different. Also, different versions of N3 algorithm produces slightly different tissue probability maps. Tools for using these atlased can be found in the Software section. VS Fonov, AC Evans, RC McKinstry, CR Almli and DL Collins, Unbiased nonlinear average age-appropriate brain templates from birth to adulthood, NeuroImage, Volume 47, Supplement 1, July 2009, Page S102 Organization for Human Brain Mapping 2009 Annual Meeting. For questions related to the MNI ICBM 2009 atlases (rather than the website), please vfonov [at] bic.mni.mcgill.ca (contact us).